Bees are dying in droves, with serious consequences for our farmers, which rely on the furry yellow workers to deliver the pollen that allows their food crops to produce fruit. In China, farmers have already experienced what it’s like to farm without bees—and it’s no easy feat. Studies abound that document the problem of bee decline around the world. For example, the rusty patched bumble bee, an important pollinator of wildflowers, cranberries, blueberries, and apples, was once abundant throughout the United States, but it is now threatened with extinction, according to Xerces, a nonprofit conservation group. It appears to be getting worse too since the problem first became apparent in the 1980s. Nearly one-quarter of the honeybee population in the United States died over the winter of 2013/2014 according to a report by the U.S. Department of Agriculture, the Apiary Inspectors of America, and the Bee Informed Partnership. A recent assessment by the International Union for Conservation of Nature recorded that throughout Europe 1 in 10 bee species is facing extinction. Every year thousands of villagers arrive for the arduous task of meticulously pollinating every single blossom by hand. Reasons for the decline, often dubbed “colony collapse disorder,” are many, but look to be largely of our own making. They include new and potentially bee-harming pathogens and parasites, a lack of bee nutrition due to a reduction in available pollen sources, and the harmful effects of toxic pesticides sprayed on crops and ingested by bees, according to the U.S. Department of Agriculture. While the problem exists worldwide, nowhere is it more disturbing than in China’s mountainous Maoxian region, in Sichuan Province, where farmers were forced to pollinate their apple orchards by hand after experiencing the loss of their entire wild bee population. The pollination of apples in Maoxian has to be completed within five days in order for the trees to bear fruit—so every year thousands of villagers arrive for the arduous task of meticulously pollinating every single blossom by hand, according to Dave Goulson, writing for chinadialogue, an independent nonprofit with offices in London and Beijing. Using homemade pollination sticks made from chicken feathers and cigarette filters dipped into plastic bottles filled with pollen, a single person can pollinate 5 to 10 trees in a day. Children also participate by climbing the trees to reach the higher branches. The population of Maoxian is around 91,200, with a 6,437-hectare growing area approximately three times the size of Manhattan Island, New York. Apple production in the Maoxian valley began in 1946 with 400 trees. By the 1980s, the region boasted over 200,000 trees and apples were the county’s leading cash crop. A 50 percent decline in overall productivity was attributed to the mysterious bee loss phenomena. By 1998 Maoxian had reached it’s peak, producing 30,000 tonnes (33,069 tons) a year with a total value of 40 million yuan (US$6.4 million). Along with the valley’s growing commercial success came an increase in the use of pesticides, which steadily took over the more traditional organic methods of fertilization, beginning in the 1970s. The Maoxian apples, known as “maowen apples,” became famous throughout China and beyond, with their renown reaching as far as Russia and parts of Southeast Asia. However, by 1990, a 50 percent decline in overall productivity was attributed to the mysterious bee loss phenomena. As part of its investigation into the reasons for bee declines globally, the nonprofit BioProfit went to China in 2001 to investigate the loss of bees in Sichuan valley. While they were unable to confirm the exact cause of the disappearance, researchers attributed it to a combination of factors. According to numerous findings, pesticide use has been a major factor in cases throughout the world contributing to the decline in bees. Another major factor in Sichuan region was over-extensive farming contributing to a loss in natural bee habitat. At one point, commercial bees were introduced into the area to fill in for the indigenous bees, but due to the overuse of pesticides, they all died, according to BioProfit. Another factor that plays a role in fruit farming is that of pollinizer trees, which are typically mixed in with the orchard. They produce pollen, which gives the bees a source with which to fertilize the rest of the fruit. A typical example would be the crabapple. Scientists recommend for a successful apple crop, there should be 25 percent to 33 percent crabapple trees mixed in with the commercial crop. 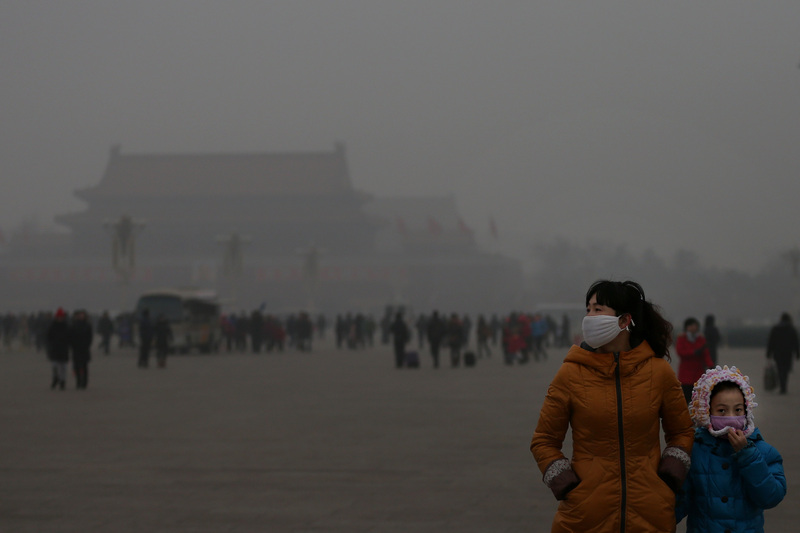 Air Pollution in China Prime Culprit for Climate Change Woes? The Maoxin farmers typically planted less than 10 percent crabapple trees, as they didn’t think it would be commercially viable to have more due to the small land-holding size each farmer owned. Temperatures and changing weather conditions also likely played a role. The farmers regularly reported fluctuations in the weather, characterized by quick temperature changes, and rain and hailstorms during the blossoming periods. BioProfit returned in 2011 to find that most farmers had replaced their apple groves for more manageable crops that didn’t need bees for pollination, like plums, walnuts, cherries, and others. Thus the great Maowen apple industry came to an end. Of large concern throughout China is its huge pollution problem, and over pesticide use is a major contributing factor. Since the 1970s, the heavy-handed use of chemical pesticides has proven very popular with Chinese farmers as they strive to protect their crops from insects. Ever since the dawn of agriculture, farmers have relied on pollinators to fertilize new life. The standards of use set by the ministry of agriculture tend to be ignored by farmers, and the laws are a lot more lenient in China than in more regulated countries where the distribution of pesticides would be in the hands of companies certified to do so, according a report by Yang Meng of chinadialogue. The overuse of pesticides in China has become a big part of Chinese agriculture and is becoming a huge environmental and food safety problem, wrote Meng. “The Ministry of Agriculture has standards for use, but if the standard says to use one bottle cap’s worth of pesticide the farmers will use three, just to make sure,” Xu Ming, director of the Pollution Prevention Office at the Ministry of Agriculture’s Agro-Environmental Protection Institute, told chinadialogue. Also, when a biological or natural pesticide costs 10 times the amount of its chemical counterpart, the money-conscious farmer would tend to pick the latter. Ever since the dawn of agriculture, farmers have relied on pollinators to fertilize new life, and bees make up for a third of this workforce. The problems faced by farmers in Maoxian offer a haunting insight into what could one day happen on a global scale. Imagine a world without bees … our supermarkets would be dramatically empty. Air pollution was one of the main issues discussed at the recent United Nations Climate Summit.